Let’s compare the spreads today to that of December 18, the start of the December 2018 FOMC meeting. An in regards to recession the economy is weakening fast. US core factory orders (ex transports) fell for the second month in a row in December. This is the worst sequential drop since Feb 2016. New orders ex-trans fell 0.6% in Dec. after falling 1.3% the prior month. The headline factory orders rose 0.1% MoM (well below the 0.6% MoM gain expected). Capital goods non-defense ex aircraft new orders for Dec. fall 1% after falling 1.1% in Nov.
Non-durables shipments for Dec. fall 1% after falling 2% in Nov.
Not a pretty picture, but it was an 8.0% drop in Defense spending that triggered the weakness – so we’re gonna need moar war. This entry was posted in Bonds and tagged bond market, inverted yield curve, Recession on February 27, 2019 by Bone Fish. 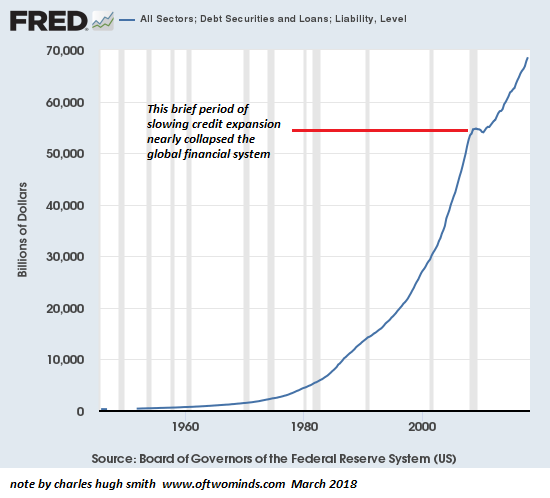 (Charles Hugh Smith) As I discussed in We’re Overdue for a Sell-Everything/No-Fed-Rescue Recession, recessions have a proximate cause and a structural cause. 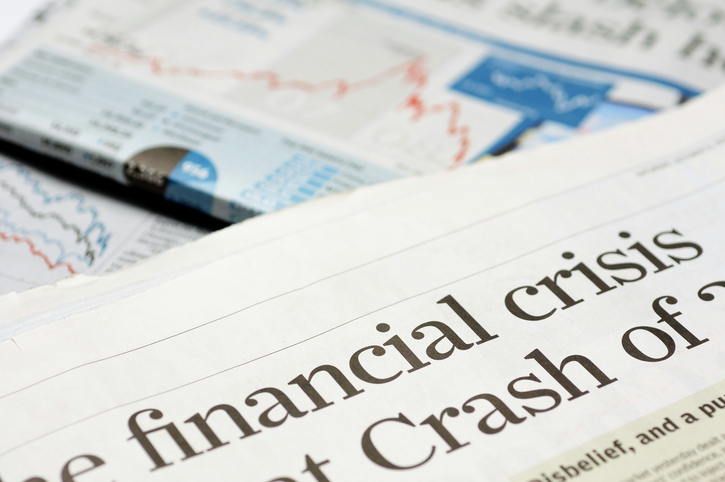 The proximate cause is often a spike in energy costs (1973, 1990) or a financial crisis triggered by excesses of speculation and debt (2000 and 2008) or inflation (1980). 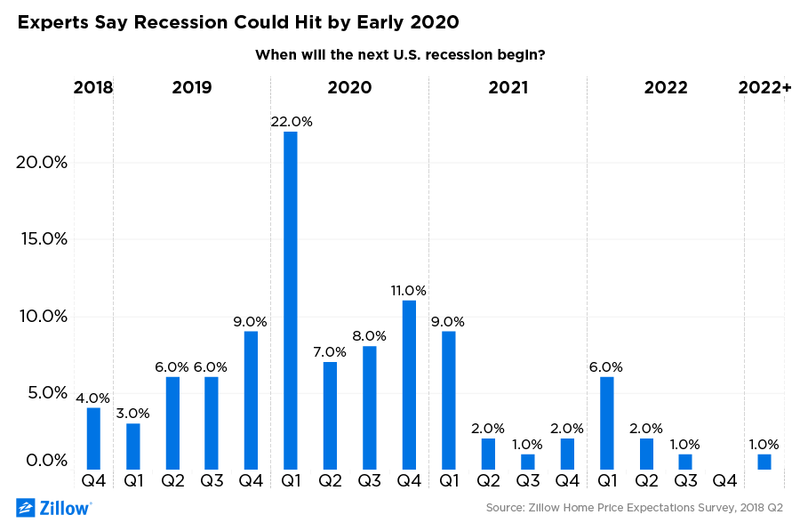 This entry was posted in Economy and tagged Recession on February 15, 2019 by Bone Fish. That one sentence provoked numerous phone calls and emails, all seeking elaboration. What did Peter mean by that statement? In an old-style economic cycle, recessions triggered bear markets. Economic contraction slowed consumer spending, corporate earnings fell, and stock prices dropped. That’s not how it works when the credit cycle is in control. Lower asset prices aren’t the result of a recession. They cause the recession. That’s because access to credit drives consumer spending and business investment. You see, it’s not just borrowers who’ve become accustomed to easy credit. Many lenders assume they can exit at a moment’s notice. One reason for the Great Recession was so many borrowers had sold short-term commercial paper to buy long-term assets. Things got worse when they couldn’t roll over the debt and some are now doing exactly the same thing again, except in much riskier high-yield debt. We have two related problems here. Both are problems but the second is worse. Experts tell me that Dodd-Frank requirements have reduced major bank market-making abilities by around 90%. For now, bond market liquidity is fine because hedge funds and other non-bank lenders have filled the gap. The problem is they are not true market makers. Nothing requires them to hold inventory or buy when you want to sell. That means all the bids can “magically” disappear just when you need them most. These “shadow banks” are not in the business of protecting your assets. They are worried about their own profits and those of their clients. Gavekal’s Louis Gave wrote a fascinating article on this last week titled, “The Illusion of Liquidity and Its Consequences.” He pulled the numbers on corporate bond ETFs and compared them to the inventory trading desks were holding—a rough measure of liquidity. The “new class” of investors he mentions are corporate bond ETF and mutual fund shareholders. These funds have exploded in size (high yield alone is now around $2 trillion) and their design presumes a market with ample liquidity. We barely have such a market right now, and we certainly won’t have one after rates jump another 50–100 basis points. To make matters worse, many of these lenders are far more leveraged this time. They bought their corporate bonds with borrowed money, confident that low interest rates and defaults would keep risks manageable. In fact, according to S&P Global Market Watch, 77% of corporate bonds that are leveraged are what’s known as “covenant-lite.” That means the borrower doesn’t have to repay by conventional means. Somehow, lenders thought it was a good idea to buy those bonds. Maybe that made sense in good times. In bad times? It can precipitate a crisis. 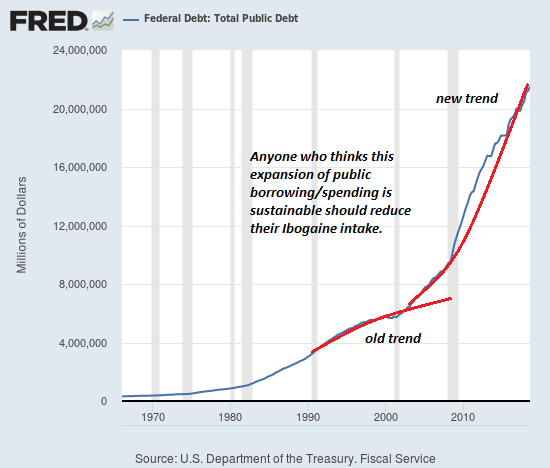 As the economy enters recession, many companies will lose their ability to service debt, especially now that the Fed is making it more expensive to roll over—as multiple trillions of dollars will need to do in the next few years. Normally this would be the borrowers’ problem, but covenant-lite lenders took it on themselves. The macroeconomic effects will spread even more widely. Companies that can’t service their debt have little choice but to shrink. They will do it via layoffs, reducing inventory and investment, or selling assets. All those reduce growth and, if widespread enough, lead to recession. Companies will need to refinance an estimated $4 trillion of bonds over the next five years, about two-thirds of all their outstanding debt, according to Wells Fargo Securities. 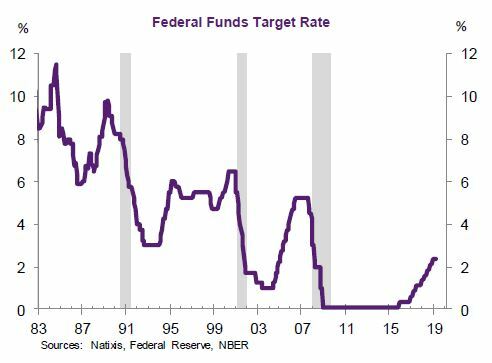 This has investors concerned because rising rates means it will cost more to pay for unprecedented amounts of borrowing, which could push balance sheets toward a tipping point. And on top of that, many see the economy slowing down at the same time the rollovers are peaking. But they’re required to pay redemptions, so they’ll have to sell their “good” bonds. Remaining investors will be stuck with an increasingly poor-quality portfolio, which will drop even faster. Wash, rinse, repeat. Those of us with a little gray hair have seen this before, but I think the coming one is potentially biblical in proportion. This entry was posted in Economy and tagged Credit, Recession on May 18, 2018 by Bone Fish.